• EZ-Tilt Deck Mount makes cleaning, emptying and storing simple. 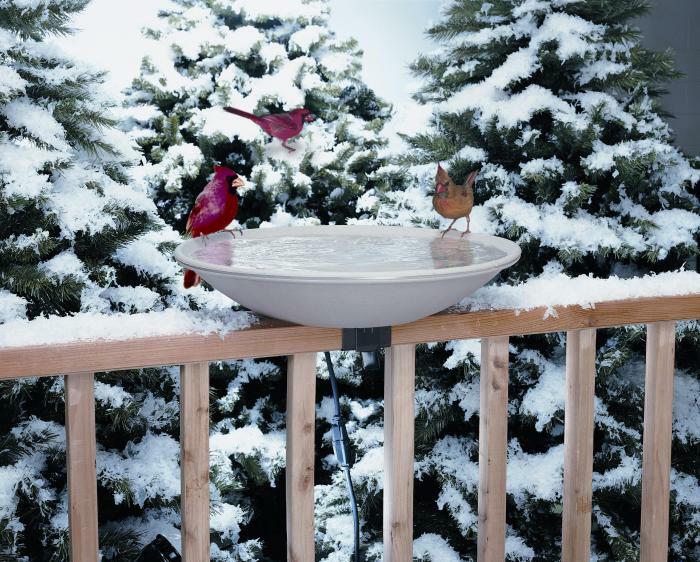 This is a great bird bath/drinking fountain! The birds are very happy with it. We haven't tried it in the winter yet, so hopefully, it will warm the water as it's supposed to. I love this birdbath! I live in a town home, so I don't and can't put anything on the ground as it is common property. I couldn't see it anyway because my deck is 5 feet up from the ground. This is the perfect solution. It only took a few minutes to mount to my deck rail. It is very easy to clean. The birds (and even the squirrels) love it. My neighbors love to sit on their decks and watch all the morning doves, cardinals, blue jays, finches, and whomever else decides to visit. It holds a lot of water. I'm really glad I purchased this bird bath! This is a good item, works well, fast shipment and good communication during purchase. The heated bird bath works just great here in the very cold north country. When the temps were below zero last week, the bath remained clear and available for the birds. 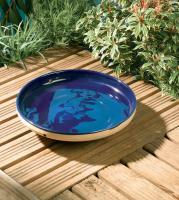 It is easy to install but does need attention to keep it filled as the water evaporates quickly in cold, dry weather. This unit is highly recommended. This item works very well even in the -20 weather we are having right now. We love it. I bought this bird bath for my in-laws. They are now enjoying it from their breakfast table every day. Mountains of snow, yet there is water for the birds to play in. It is a great product and I will have to purchase one for myself. Thank you. I'm very pleased with your site and my heated bird bath. The bird bath is wonderful. The installation is simple. The size and depth are perfect. Also, the rough texture aids the birds who go down into the water. This item was very simple to install and works like it says. 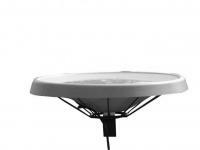 For those who are looking for a "close to the house" winter-time bird waterer I highly recommend this unit. We had to do a bit of adjustment to get it installed. It was not quite fitted right to the attachment. But, after getting it installed, it has been wonderful watching all the birds and squirrels drinking from it. On really cold days, it does need to be refilled often due to steam.